Recently the The District Administrative Court of Kiev cancelled the order of the Ministry of Ecology and Natural Resources of Ukraine regarding entering of the European elk into the Red Book of Ukraine for protection and allowed hunting on this species. 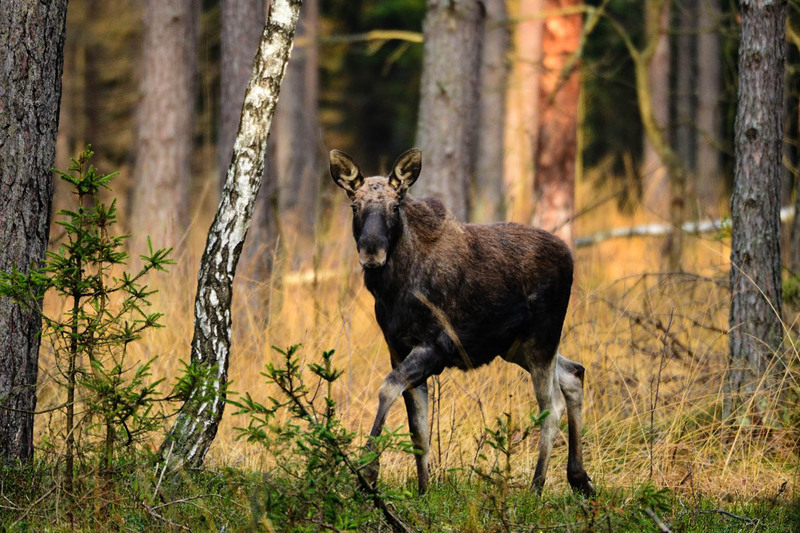 Amongst arguments for the support of this decision, is that the increased population of elk (also called moose or Alces alces), is now a threat for Ukrainian forests. Whilst neighbours of Ukraine introduce restoration programmes for the elk, Ukraine intends to kill this large herbivore. Maybe a natural solution, like stopping hunting carnivores, would help to solve this and also other challenges of misbalanced ecosystems? The Red Book of Ukraine is a list of endangered species that need to be strongly protected. One of the main reasons of the court decision to cancel the inclusion of the elk to the Red Book of Ukraine, thus allowing hunting on elks, was that the Ministry and other involved ecological and scientific organisations couldn’t substantiate that the elk is becoming a vulnerable species. The exact data on population number and its dynamics was not provided. An accurate inventory of the elk was recently conducted, but only partly and in one sub-region (oblast) of Ukraine. There, 90 individuals of European elk were recorded. Unfortunately data from other sub-regions is not consistent or updated. According to behaviour peculiarities the inventory of elk is most reliable during autumn-winter. Recently applied methodologies of elk inventory (as well as other wildlife species) are not reliable. During my field trips I even saw a wildcat, but not a single elk. In such a way, the elk was present in the Red Book of Ukraine for only one year. The Red Book is not providing practical protection for these species. The elk uses pine forests for protection and also as a food sources, but unfortunately these forests are disappearing in Ukraine. At the same time the level of poaching is quickly increasing. This, together with other reasons, may lead to elk disappearing from Ukraine in 2-3 years. The same problem also occurs in neighbouring Belorussia. According to some experts, this may even happen without direct human intervention (hunting/habitat loss), due to climate change and the dynamics of the species. But on the other hand, elks often allow people to approach very closely. and therefore they are easy prey for poachers. This happens also in the protected areas. Some believe that game management protects elks. They say that “good” hunters protect elk against bad poachers. As one of the Ukrainian media informs, current hunting on elks aims at finding adult elks with nicely developed antlers. Therefore through natural selection, the elk is evolving smaller antlers to avoid poachers. Additionally, hunting on female elks is allowed, which decreases the reproduction and population growth of elks. Many female elks are shot in January, whilst they are pregnant, because they resemble male elks (who don’t have antlers in January). The hunting season is said to be too long in Ukraine, and many hunters do not have their 1 hunter license. It is clear that humans should reduce their intervention and elk hunting, if balanced nature is the aim. Without humans the elk population will regulate itself, restoring balance. Additionally if other wildlife such as large carnivores are not disturbed, the whole ecosystem may be able to recover. A very good example about the wolf restoring balance in the nature of Yellowstone is available here. Also it is a well-known fact that carnivores not only prevent overpopulation of other species, but they also help populations to become healthier. Of course most of the hunters know about these roles of the carnivores very well. But they prefer to hide their passion towards chasing and killing elks and other animals under the damage they are causing to the forests. – Iryna Shchoka from European Wilderness Society. Recently the Ukrainian Association of Fish and Game Users has been working against the introduction of new laws forbidding regulation of carnivore populations in Ukraine. Wolf are being hunted each year. The number of these annually killed carnivores is around 1 000. Uncontrolled increase of the carnivores may lead to the decrease of other species for hunting. Among those are also rare species, which become the food source of such carnivores… Besides situation with Golden Jackal, which is considered as a big threat for livestock in Southern Ukraine. Humans should not behave as owners of nature and its wildlife, but should instead learn how to enjoy it and live in harmony. The European Wilderness Society works all across Europe, advocating for the protection of nature and its wildlife.